Delicious Cupcakes decorated with rainbow fizzy belts! 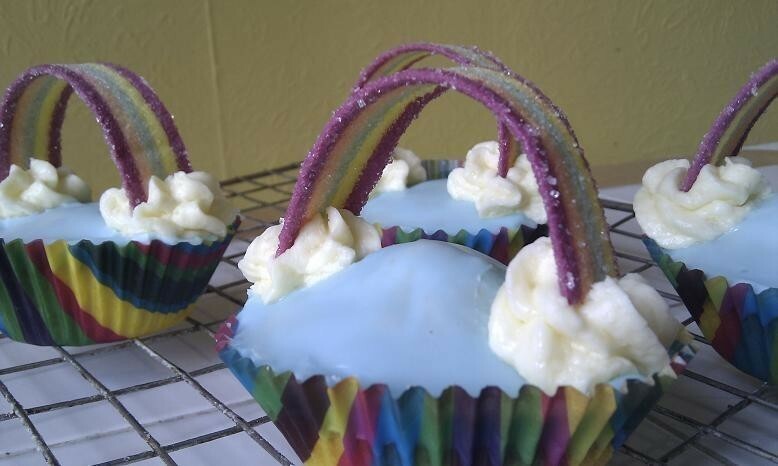 Cupcakes decorated with fizzy rainbow belt sweets/candy! So there is a recipe below for everything. I added dessicated coconut to the cakes and the white icing so do that if you like coconut too. Also if not adding coconut the cakes and icing will all be extra tasty with a little vanilla. Add 2 eggs, one at a time, beating in. Spoon batter into cupcake wrappers/cases to half full. 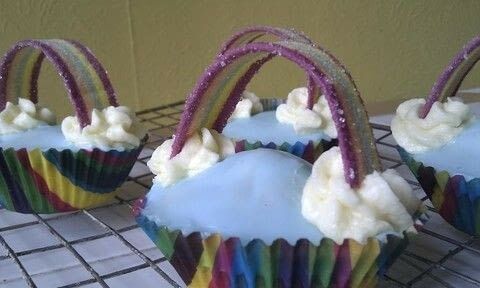 Make the blue icing. Using icing sugar make up water icing to the correct consistency which is so it will move when put on the cupcake but not too much. Remember to put icing sugar in the bowl FIRST, put in colouring and vanilla then add water a little at a time so you don't overdo it. I suggest about 150-200g icing sugar and go from there. Take cool cupcakes and place a blob of icing in the middle and allow it to run down to cover the cake. If it doesn't cover it entirely add more or if it almost does use a teaspoon to move it to the edges yourself. Allow to set. 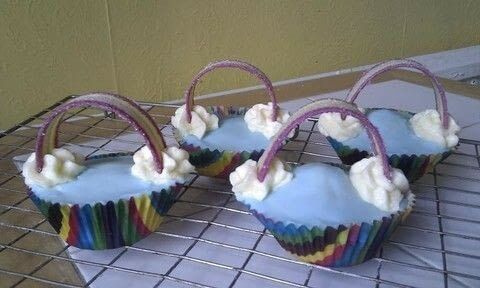 Now make the icing for the white 'clouds'. Mix 50g butter and 200g icing sugar well - beat to make it extra fluffy if you want. You can also optionally add coconut to this icing (around 25g) if you want. You can either pipe this on with a piping bag or just place it on in blobs with a spoon. Either way place the two clouds at opposite sides of the cupcake. 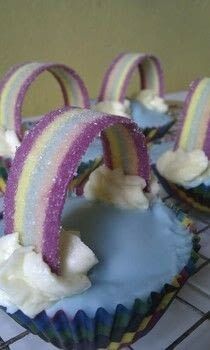 Before the white cloud icing sets take the fizzy belts and cut to a size of approx 10cm (if necessary) and then place either end in the clouds to make the rainbow! oh my god, I have to make some of these when I get the ingredients! So cute!!!!!!!!!! These are so cute and creative! I didn't use thick buttercream icing, so the sour straps/fizzy belts/gay bacon slipped a bit, but overall they looked and tasted wonderful! thanks so much for the recipe! I think the US would have to use the air heads extremes sour strips. These look too cute! My cousin would love me if I made them for her birthday, haha. What are "Fizzy Belts"? Are they available in the US? WHOA! I got the idea to make something like this last week, but I haven't been able to go to the store to get the candy!